For many, a warm meal isn’t just an opportunity for nutrition – it’s also an opportunity for connection. Open Hearts Ministries (OHM) operates out of the First Baptist Church at 217 Main Street in Haverhill, Mass., and offers both food and a safe place to for those in need in and around Haverhill to socialize. In support of this mission, Berkshire Hathaway HomeServices Verani Realty (Verani) is proud to donate $1,000 to OHM as part of its commitment to helping others. Open Heart Ministries (OHM) provides hot meals and a safe place to socialize for people of all walks of life. Each Sunday, OHM’s community meals offer a nutritious main dish, two sides, soup, bread, drinks and dessert. Volunteers at OHM also offer home-cooked meal delivery to people who have difficulty leaving their houses, and a monthly senior meal. They have been feeding the local community for almost 20 years. The donation was made through VeraniCARES, Verani’s social development arm that encourages and enables agents and employees give back to their communities in unique ways. Agents and staff can donate to the fund by pledging a portion of each commission or paycheck, and Verani will match each donation up to $10. 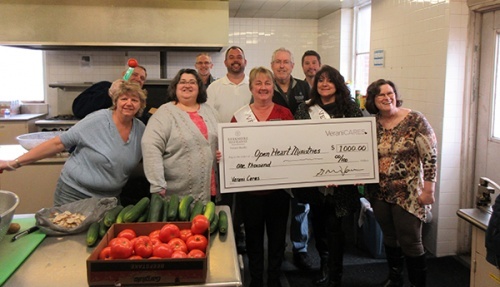 VeraniCARES has donated over $55,000 to the communities it serves throughout New England, with its May 2018 campaign expecting to disperse another $40,000. "We have been involved with most aspects of OHM’s Sunday meal, including food runs to the Greater Boston Food Bank, serving the meal, and also cooking for the meal," he said. "We have wonderful volunteers. It truly has been a blessing to us, seeing the families that come join us for an afternoon of good food and community." Each week, more than 40 volunteers prepare, cook, serve, and deliver enough meals to meet the needs of over 200 people in the greater Haverhill area. To learn more about the important work happening at OHM or to get involved with its mission, visit openheartsministries.org, call (978) 374-7491 x2004 or email admin@openheartsministries.org.